Dr. Janet K. Yamamoto is a professor of retroviral immunology in UF Veterinary Medicine’s department of infectious diseases and pathology. She received her Ph.D. in microbiology, with a focus in immunology, from the University of Texas Medical Branch at Galveston. In 1984, she established the HIV/AIDS BSL3 laboratory under the joint directive of the Schools of Medicine and Veterinary Medicine at the University of California Davis, which was later awarded Center for AIDS Research funds for the northern California region from NIH. Yamamoto, together with Nobel laureate Dr. Francoise Barré-Sinoussi, was the first to demonstrate and publish that interferon-gamma will not protect against HIV-1, and she has served as the consultant for the second FDA-approved HIV-1 Western blot for HIV-1 confirmatory test. Yamamoto co-discovered, characterized, and co-patented feline interferon-omega which was commercially released in Europe and recently in the U.S. as a supplemental therapy against viral diseases of cats. As a part of the world effort to discover a small animal model for HIV/AIDS, in 1986 she co-discovered the feline immunodeficiency virus, FIV, the feline counterpart of HIV. She also invented the first commercial FIV vaccine, sold by Pfizer-Zoetis and Boehringer. 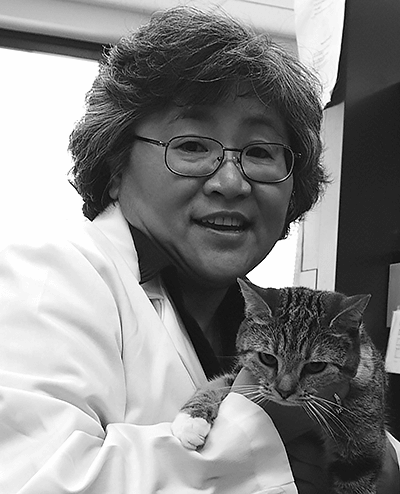 Yamamoto’s laboratory has studied the immune mechanisms of protection conferred by her FIV vaccine and determined that the major portion of this vaccine protection against global FIV isolates is mediated by anti-FIV T-cell immunity rather than by anti-body immunity. Her team has also discovered that AIDS viruses such as FIV and HIV-1 carry, as part of their structural proteins and enzymes, protein pieces called epitopes that enhance viral infection, whereas other epitopes may inhibit infection. Her laboratory is currently selecting anti-AIDS viral T-cell epitopes that are conserved among FIV, SIV and HIV-1 to minimize mutational affect and to broaden protective efficacy. Since these epitopes are conserved between FIV and HIV-1, the FIV sequences of such epitopes have been formulated as synthetic peptides and tested against FIV in laboratory cats. A pilot study showed a promising result with only a few T-cell epitopes, and currently a major trial using a large number of T-cell epitopes is ongoing. If successful, the HIV counterpart epitopes will be used to develop an effective T-cell-based HIV vaccine for humans. When used in combination with antiretroviral drugs, these vaccines have the potential to cure HIV and FIV infections in HIV-positive humans and infected cats, respectively. Yamamoto holds 20 U.S. and 14 foreign patents and donates all of her personal patent royalty and licensing income to her research.